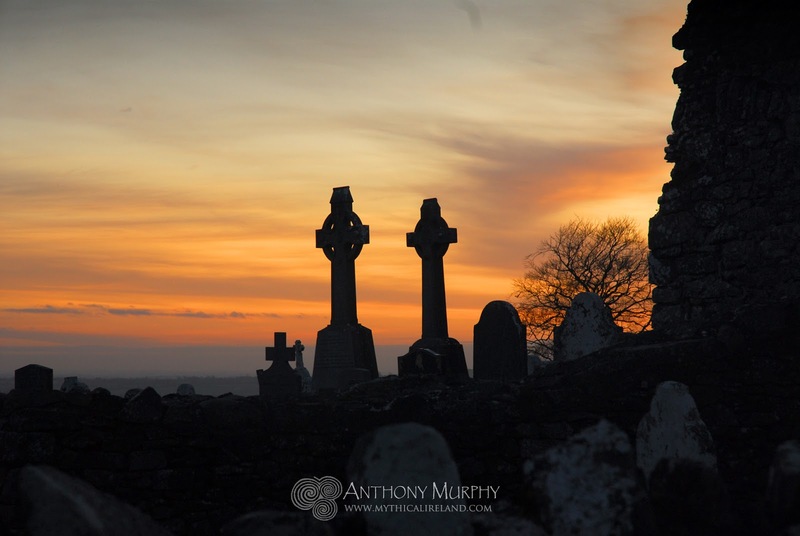 There are many strange tales in the myths and folklore of Ireland. One, several variants of which can be found in different localities, concerns the idea of a city or village beneath a lake or the sea. Sometimes, as in the legend of the mysterious island of Hy Brazil, the underwater realm becomes visible once every seven years. An extraordinary deluge tale was once recounted in the folklore of a fishing village called Blackrock (Na Creagacha Dubha), on the County Louth coastline near Dundalk. 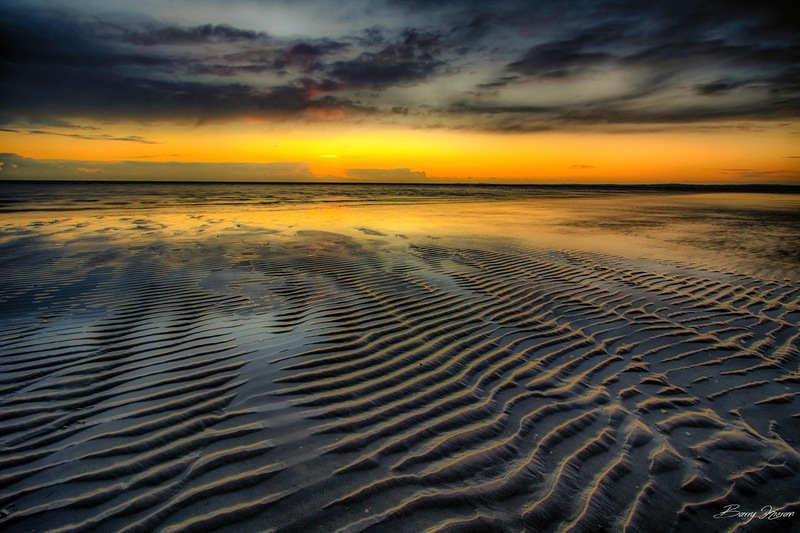 A wonderful photo of the breaking dawn at Blackrock beach by Barry Kieran. This village, which mostly fronts on to Dundalk Bay, faces out across the restless waters, offering its residents lovely views of the Cooley Mountains, whose undulating peaks roll out eastwards into the Irish Sea. Blackrock's flood lore relates to a local version of a well-known song called Déalradh án Lae, 'The Dawning of the Day', written by James Clarence Mangan. A note appended to the song in a manuscript by transcriber Nicholas O'Kearney says: "This song is founded on a tradition prevalent among the people in the vicinity, that an ancient city, with fine land adjoining it, are seen every seventh year by the fishermen off Blackrock shore near Dundalk. 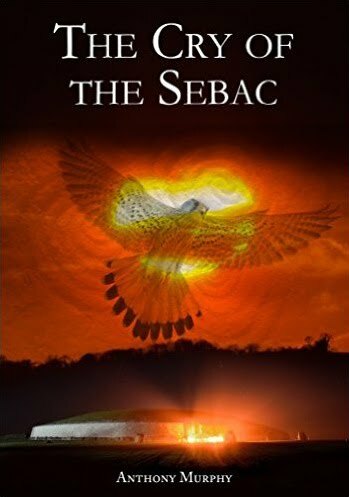 The bard, remembering the legends of Gerald Iarla in Mullach-Elim, and O'Neill in Aileach, considers the appearance a favourable sign for Ireland's liberation." "It may have happened, time out of mind, that a city and land in this part of the Island were encroached on by the sea. A great causeway, built with huge mountain stones, has been traced from Dunany to Cooley Point, a distance of more than seven miles across the Bay of Dundalk . . . The old people used to tell many stories of the inhabitants of the enchanted city, and assert that some of their offspring still live at Blackrock." In the lily-bell and rose. And the soft cuckoo was sure to follow. 'Twas the Dawning of the Day! In a trance of witcherie. Clad, and wielding shield and spear! Swords and chariots, and a phantom fray. In the Dawning of the Day! Now arose to daze my sight. In the dim chill Dawn of Day! I'm not entirely sure whether this old song is related to the one very well known in modern times as sung by the likes of Mary Fahl (see video below). Luke Kelly sang Patrick Kavanagh's poem 'On Raglan Road' to the air of 'Dawning of the Day'. With thanks to Barry Kieran for permission to use his beautiful photo of Blackrock. With the Winter Solstice here, and the shortest days and longest nights having arrived, the aurora borealis (northern lights) treated us to a timely and magical display over Newgrange tonight. 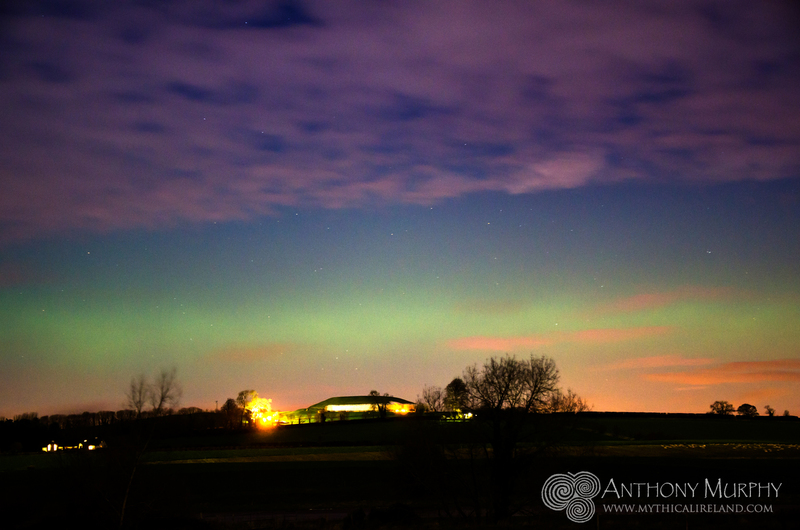 I hope I have captured some of this magic for you to enjoy. Happy Winter Solstice from the Boyne Valley! Newgrange and Mound B (left) with an emerald green sky filled with winter solstice aurora tonight. Green is the Irish gold . 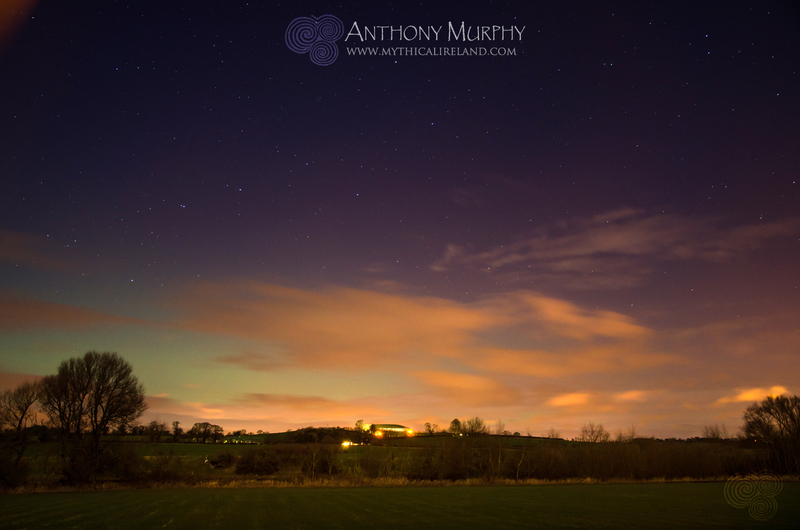 . . northern lights over Newgrange on the longest night of the year. 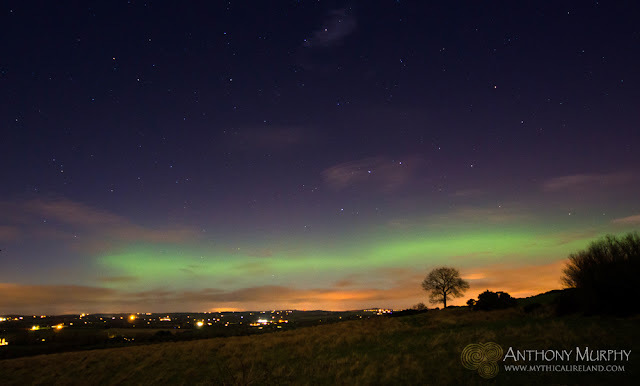 The bright green bands of the northern lights viewed from Red Mountain, with Newgrange to the lower left. Emerald Isle . . . green aurora with the Plough over the Boyne river and canal at Newgrange tonight. The aurora subdued after a while but the green still made for a great contrast with the orange clouds. 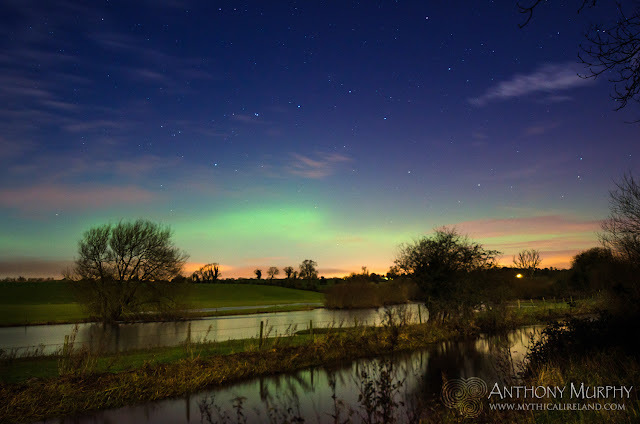 Bright green auroras shine over the Boyne Valley on winter solstice 2015. 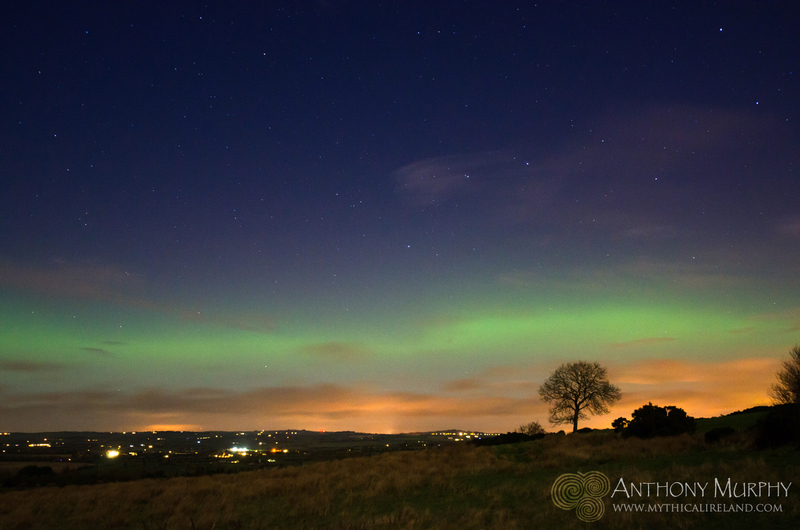 A faint band of green to the right of Newgrange. There is a thought that sometimes manifests in my head when I think about the convoluted history of my people. In the stillness of the evening, standing alone at some monument of antiquity, I wonder if it was the sheer beauty of the landscape that made my ancestors stay here – those who were the first to arrive after the ice retreated, and those who later survived imperialism, starvation and poverty. The world is a big place, and the human race is a migratory species. There were other places these ancestors could have gone to. But they held on. The forces and factors that kept them here may be the same ones that make me a captive of this wondrous island. Ireland's landscape is lush and fertile. It is beautiful and enrapturing. Many places have an otherwordly placidity about them, even today. In modern times, there is a tendency to over-rationalise and analyse, such that a landscape that has always been seen as somewhat magical and austere is reduced to something functional and banal. I suggest we refuse to occupy that space. Let us open up to a mystical vista. 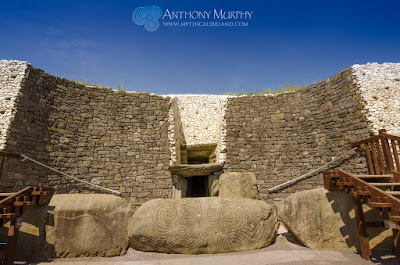 Over the past few years in particular, I’ve spent a lot of time at Newgrange, the place most associated with the Tuatha Dé Danann in mythology, known variously as Brugh na Bóinne, Síd in Broga, Síd Mac Ind Oc and the Palace of the Boyne. It’s lovely spending time out there on my own. I find it such a pleasurable and peaceful and introspective experience. I wrote about this in Newgrange: Monument to Immortality. I can go there, and can feel that, although I am only miles from home, I might have ventured to far distant otherworlds beyond the senses. I expect that plenty of other people have spent time alone in the evening at Newgrange, but I hardly ever see anyone out there at night. I like it that way. 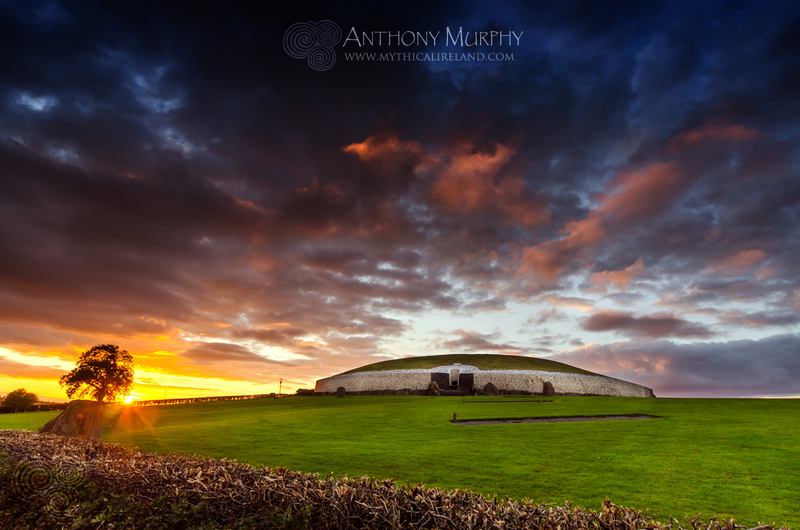 Newgrange . . . a sacred place with a message for today. 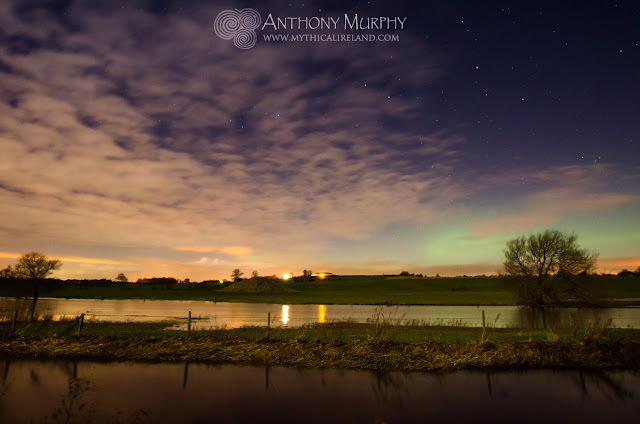 With the shortest days and longest nights upon us, in this, the season of the winter solstice, it would be nice now to think about how we first arrived into Ireland, and how our own journeying here perhaps reflects some of the other journeying going on in the world right now. In Ireland today, our story is the same as it has always been, since the first days after the ice age. It is a story of comings and goings, of arrivals and departures. Dublin Airport is a great metaphor for Irish mythology and history. There are always people arriving, and always people departing. Some are going on holidays. Others are leaving forever. How we arrive into Ireland is central to the nature of our belonging here. This is something the late John Moriarty realised and wrote about. Do we descend upon this island from a cloud, wrapped in a mist, like the Dananns? Or do we sail across the rough seas, like the Milesians, with their flotilla of ships – a Spanish Armada of the prehistoric world – to take Ireland, in an act of jealous longing, a rapacious conquest, driven by vengeance? If we do that, we will never belong here. I’d much prefer to descend into Ireland in a mist, from the stars, and set my foot gently upon her soil, wrapped up in the Féth Fiada with Manannán by my side. That way, my arrival might take place unknown, so that I could gently tiptoe across dew-covered grasses into some otherworldly copse, and there enchant my every thought with the newfound joy of arrival into an earthly paradise. I would much prefer this to a Milesian arrival. From a distance of nine waves, as a Milesian you come in sturdy ships, beating drums of battle, and unfurl your banner of war, your standard of conquest. But no nation ever conquested in spite or by subjugation or force could afterwards live a peaceful existence. 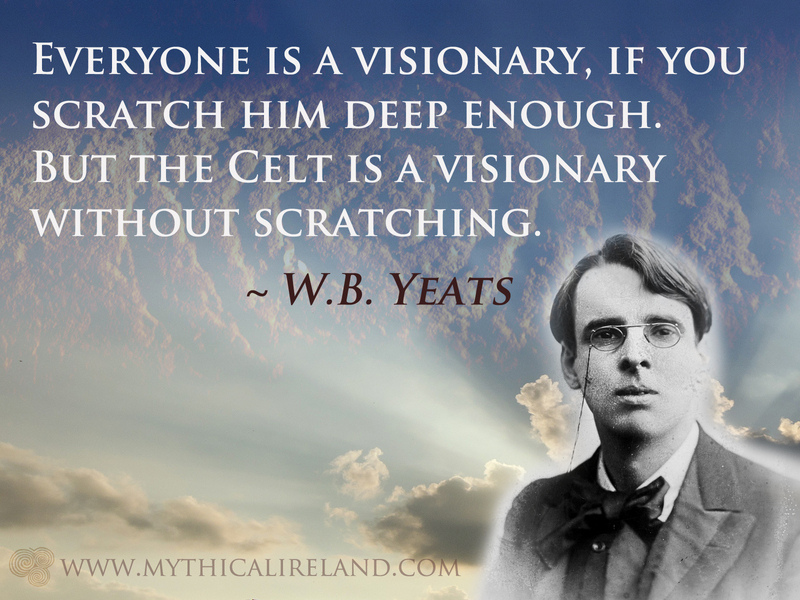 So I urge you to come like the Tuatha Dé Danann. Come in a mist. Arrive magically. And ask Eriú, gently, if perchance you can stay awhile, and dance and sing upon her carpet of tender green, and write joyous words and sing merry songs about netherworlds concealed in the ditches and vales of her beautiful quarters. And I urge you, as the light creeps up through the dark womb of Newgrange into her cold interior, to think about the fact that, as an Irish person, you are just a visitor to this wonderful place. In essence, you are a migrant. We all came here from over the sea. As a human, you are a born traveller. And if you arrive into Ireland, Danann-like – magically – you will know, as they did, that there is always room for others. This solstice, let’s share a little bit of that midwinter illumination, for the world of mankind is often dark, and right now it could do with a little bit more of that magical light. The fighting Irish . 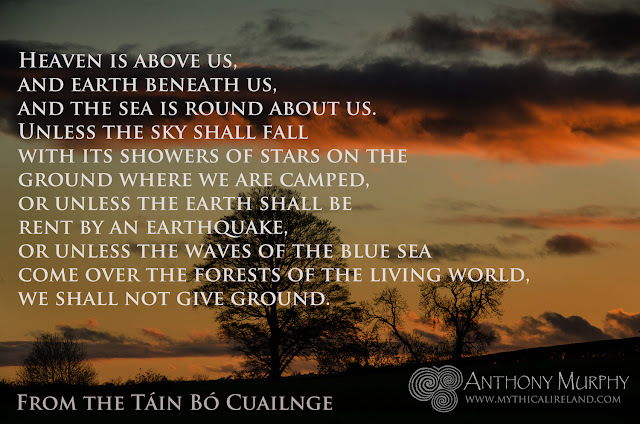 . . this is a quote from the famous Irish mythical epic Táin Bó Cuailnge. The Ulster heroes declare this to king Conchubhar when he calls upon them to leave a battle in order to meet an attack in another part of the field. and the sea is round about us. we shall not give ground. Read the entire Táin Bó Cuailnge here. 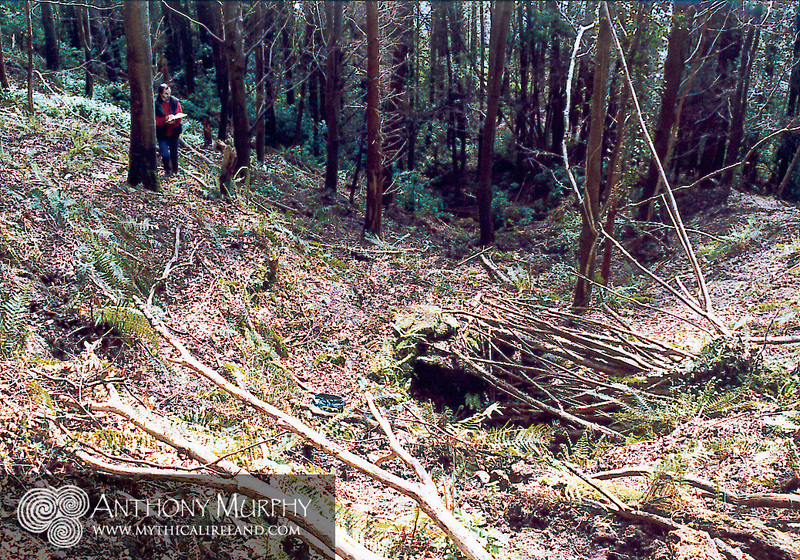 In the summer of 1999, artist Richard Moore asked me if I would like to see a strange site that he had discovered in the heart of the Boyne Valley. It sounded intriguing. "What kind of site?" I asked. He said he didn't know, but that it was located in a place where it wouldn't be easily seen by archaeologists, and he said that as far as he could tell nobody knew about it but him. The chance of an adventure into the Boyne Valley involving a mysterious unknown site, possibly an ancient monument, was indeed too tempting. So we agreed that the following weekend, we would go out there and I would bring my camera and he would bring his artist's sketch pad. The site is located on interesting terrain - a very steep forest-covered hillside that runs down to the Boyne river. It was difficult to access - even in dry weather. It can only be described as a semicircular man-made feature set into the side of the hill. 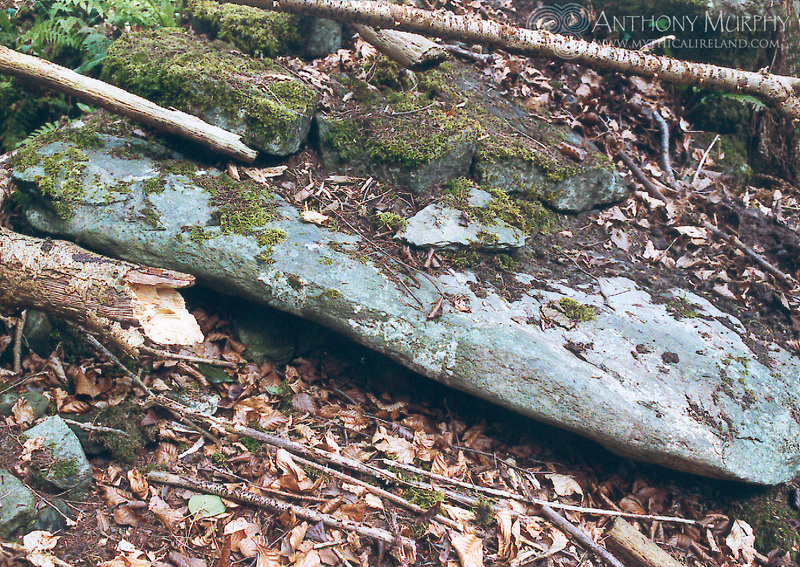 There were stones forming a distinct semicircle that appeared to create a revetment. It is possible that the area within the semicircle has some sort of flagging stones on its floor - we certainly saw one large flat stone there, and there may have been others. 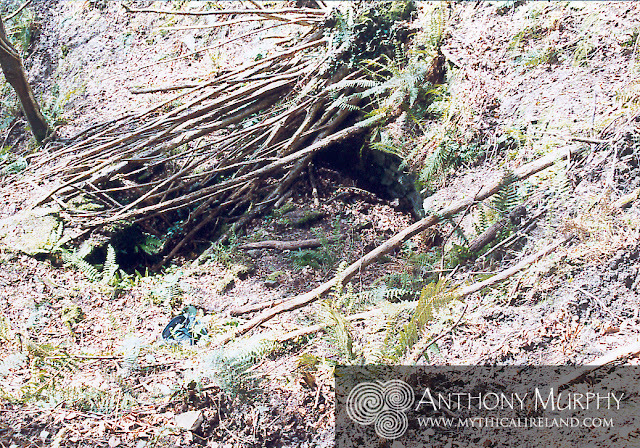 Richard Moore sketching the mystery site, which is covered by fallen trees. You can just see the Boyne through the trees. It's all so long ago now that I can't remember a huge amount about it. Without expert knowledge, I can only speculate that it might have either been some sort of holy or sacred well (now dry) or that it might have been some sort of shrine. My opinion, for what it's worth, is that this is a relatively modern construction, but the archaeologists will confirm this one way or the other. 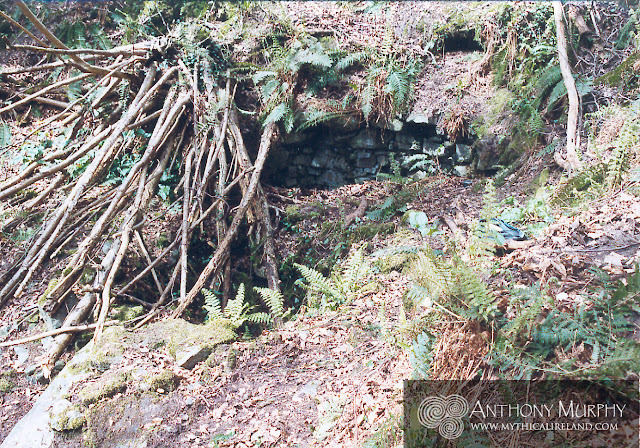 One problem on the two occasions we visited was that the feature was partially covered by fallen trees, and apart from the semicircular stone wall, there was little else to be discerned. We did, of course, report the find to a couple of archaeologists at the time. However, at the time of writing this blog it appears this possible monument is not on the Sites and Monuments Record (SMR). A major reason for that is undoubtedly the fact that the site is in a location that makes it very difficult to access - and it's hardly likely to have been noticed by many people over the years. In fact, on my first visit (we were there twice; on the second occasion I slipped and fell on the wet incline and wounded little more than my pride! ), I remember thinking "how the hell did Richard find this place?" The site viewed from above. Richard Moore points to a stone with a stick to add a sense of scale to the site. A large flat stone which might have been some sort of flag stone on the floor of the feature. Another view of the site showing how partial subsidence has concealed it. If, like most people, you are not among the winter solstice lottery winners who will have exclusive access to the chamber of Newgrange next weekend, then fret not. Because this fantastic video by Paul Kelly shows the sunlight streaming into the passage and chamber, and it's set to beautiful music that will enchant you and put you into a mystical mood! 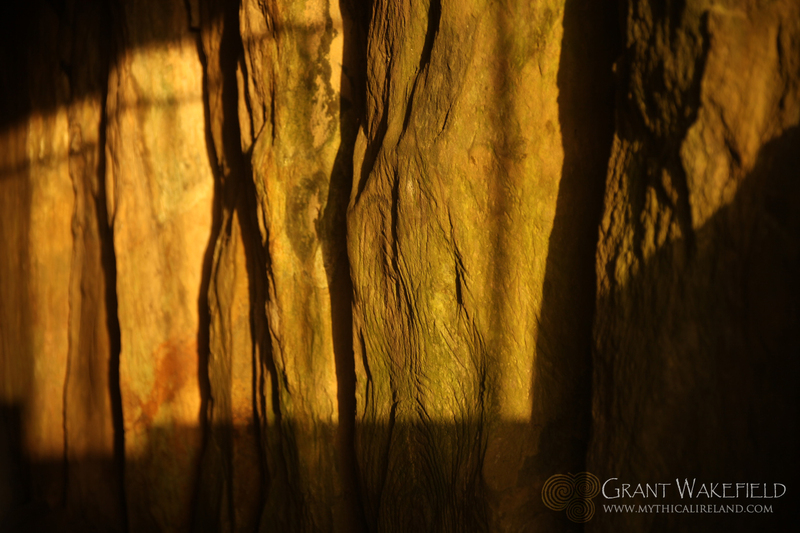 As we count down to the shortest days of the year, in a week's time, the light of the rising sun will start to enter the roofbox over the entrance doorway at Newgrange and shine into the passage and chamber. As someone who has witnessed it directly, I can tell you that it is a beautiful moment. Paul's video captures the event marvellously. We thank him for making this very special video. 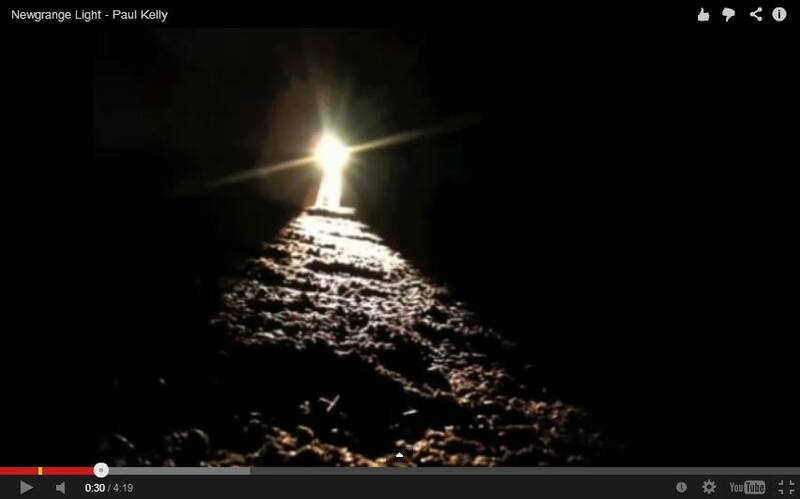 An image from Paul Kelly's wonderful Newgrange solstice video. To me, the Hill of Slane represents the place where Christianity met prehistory. Saint Patrick is said to have lit the Paschal Fire here in 433AD, bringing the flame of Christianity to a very pagan Ireland. Celtic cross headstones at Slane. The photo on the right shows two headstones in the cemetery on the Hill of Slane which are based on a Celtic Christian Cross design. This cross, to me, represents the conjunction of Christianity and whatever spirituality existed when it arrived. I see in the Celtic cross the cruciform shape that is inherent in the major passage-tombs of the Boyne Valley, which probably predate Christ by three and a half millennia. And the inclusion of the circle of the sun in the centre of the cross is just another representation of the chamber of Newgrange - where sunlight intersected the centre of the cross in spectacular fashion on winter solstice over 5,000 years ago. 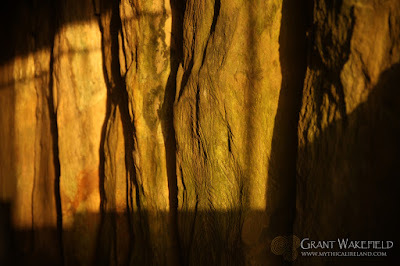 One thing that seems obvious when you walk up the eastern side of the Hill of Slane (which is the only way to get to it!) is that the monuments and remains relating to Christianity dominate, and that the "pagan" remains - which lie further up the hill on the summit - are shrouded by trees and are largely obscured from view. The dominant feature from prehistory is a mound or motte, said in local lore to the burial place of Sláine, a king of the Fir Bolg. In the summer time, it is virtually impossible to see the mound, but in winter when the foliage is gone from the trees it is possible to get a look at it. 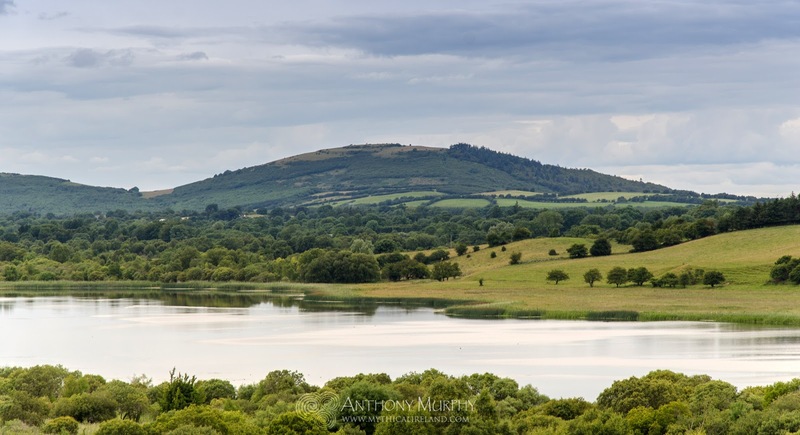 The mound of King Sláine is located shrouded in trees in the middle of this view. Richard Moore and I wrote about this mound in Island of the Setting Sun in 2006, suggesting that it might possibly be a passage-tomb dating from the Neolithic. In recent years, ground-probing archaeological techniques have been employed at the mound to try to determine if there is a possible structure within. To date, the results are inconclusive. The motte of King Sláine is very interesting for another reason. It marks the point of intersection of two ancient alignments of sites. We call these the Brigid alignment, or the Brigid's Way, and the Patrick alignment, which I prefer to call "Patrick's Equinox Journey". One thing that should be obvious about the Brigid alignment is that it must predate Christianity because it involves many prehistoric sites. Indeed we find that Brigid was venerated as one of the Tuatha Dé Danann long before Christianity came to Ireland. 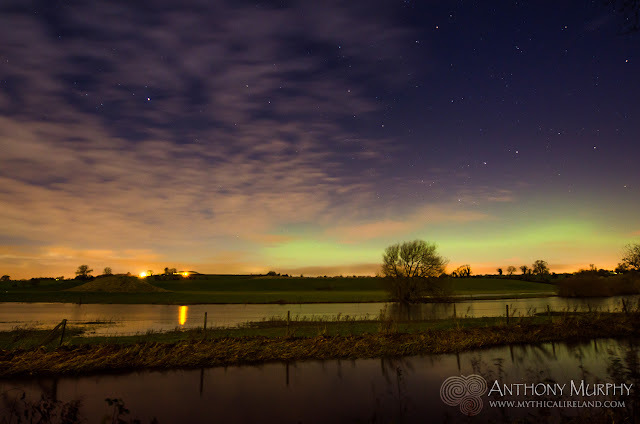 When Saint Patrick landed at the Boyne Estuary (ironically in the same place as the Milesian spiritual leader Amergin had reportedly done over two millennia previously) he made his way towards Slane. Richard Moore and I have documented an equinox alignment involving Millmount in Drogheda (another motte, said in local myth to be the burial place of Amergin) and the motte of Sláine. If you trace the line of this alignment on a map, it continues through Kells and on past Loughcrew, through the Cruachan Aí complex towards Mayo. In Mayo, the alignment follows the route of the Tóchar Phadraig, the pilgrim route from Ballintubber Abbey, through Aughagower, and eventually it lands exactly on the peak of Croagh Patrick. Is this apparent arrangement of sites from the east of the country, where Patrick landed and lit the Paschal Fire, to the west, where he battled with the demons, a coincidence? And indeed some thought must be given to the age of the alignment and its possible pre-Christian significance. 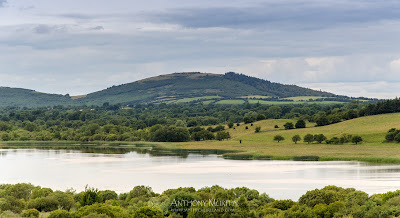 Hill of Mael in County Westmeath . . . on the Patrick alignment. It may yet be that Slane's importance in the wider landscape is not yet fully understood. The Hill of Slane is the dominant feature in the landscape viewed from the east. From Slane (although the view is obscured today by trees), the dominant features to the west would be Loughcrew and Hill of Mael. The latter, which has a very impressive monument of unknown date on its peak, is exactly on the alignment. From there, one can imagine the possibility that the pyramidal peak of Croagh Patrick might just be visible on a very clear day . . . The Hill of Mael viewed in Microsoft Bing maps. 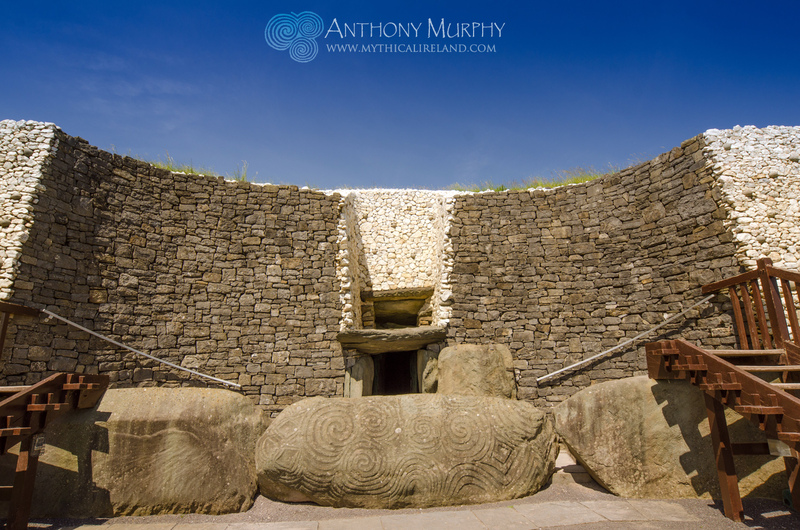 Get up close and personal with the entrance kerb stone at Newgrange - without leaving your armchair! 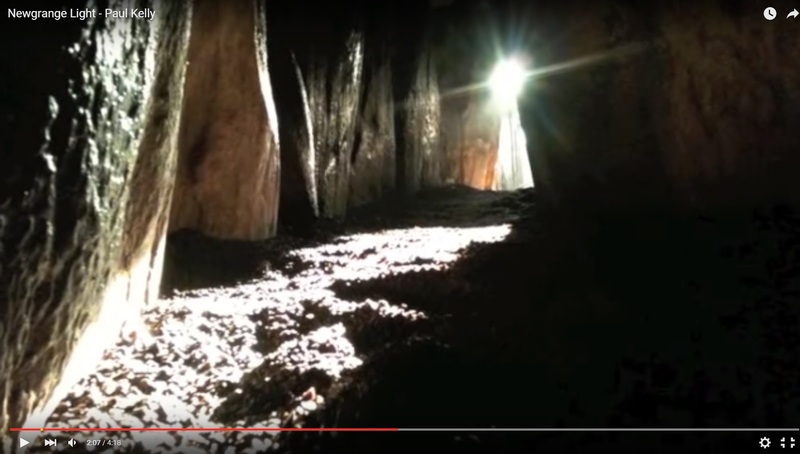 This video shows the entrance kerb stone at Newgrange (known as kerb 1) in great detail, and allows you to view the carvings on the stone without actually having to be there. It was made by the Discovery Programme and the technology used to create the scan was an Artec EVA close range scanner. 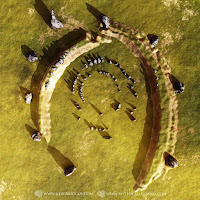 You can view the stone's famous triple spiral and the other Neolithic carvings in high resolution. Modern technology is probing the ancient Boyne Valley landscape in ways that the archaeologists of the 20th century could only dream. The above video shows just one aspect of how that is taking place. 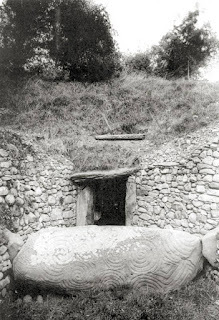 People in the furthest parts of the globe can see the 5,000-year-old carvings at Newgrange without leaving their home - in fact, without even leaving their armchair. Labels: carvings, design, entrance, kerb, Newgrange, scanner, stone, technology. 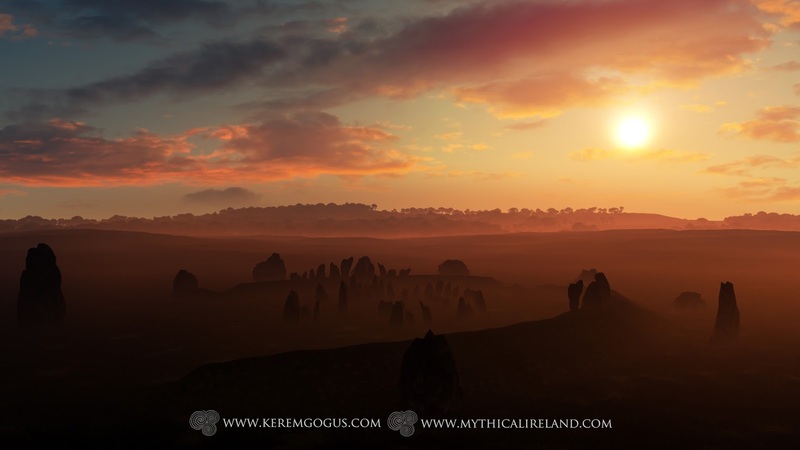 A new depiction of Ireland's Stonehenge at sunset around midwinter, by 3D artist Kerem Gogus. 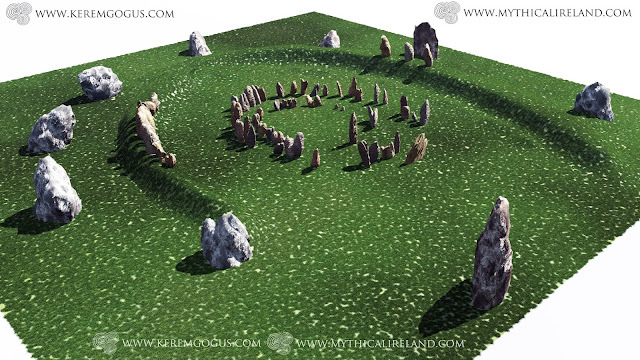 I am delighted to unveil new 3D-generated images showing Ireland's Stonehenge as it might have looked, created by 3D artist Kerem Gogus. These new images are based upon the only known depiction of a lost monument - a magnificent structure that probably dated to the Stone Age and could be considered Ireland's equivalent of Stonehenge - sadly now destroyed. 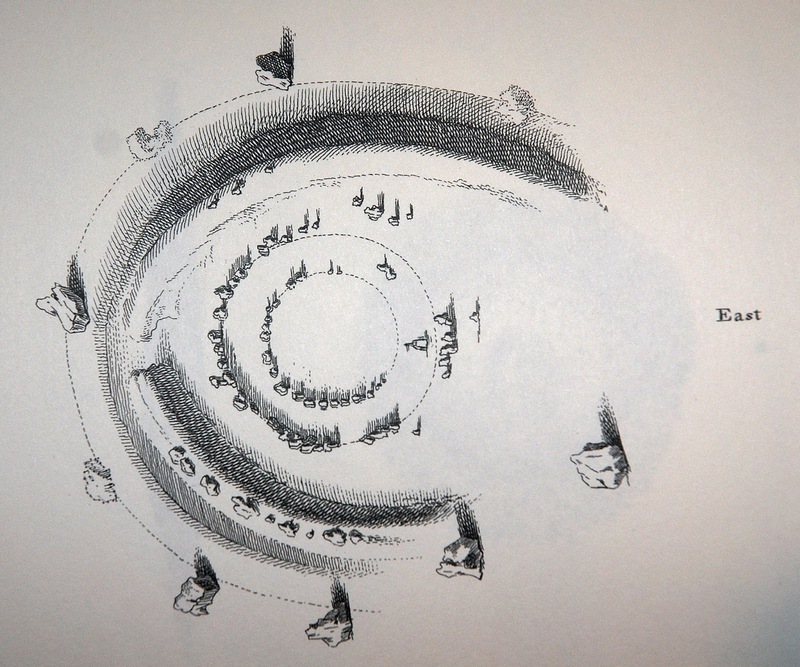 The only drawing of this great embanked structure of concentric stone circles was made by the antiquarian and astronomer Thomas Wright, in the 1740s. 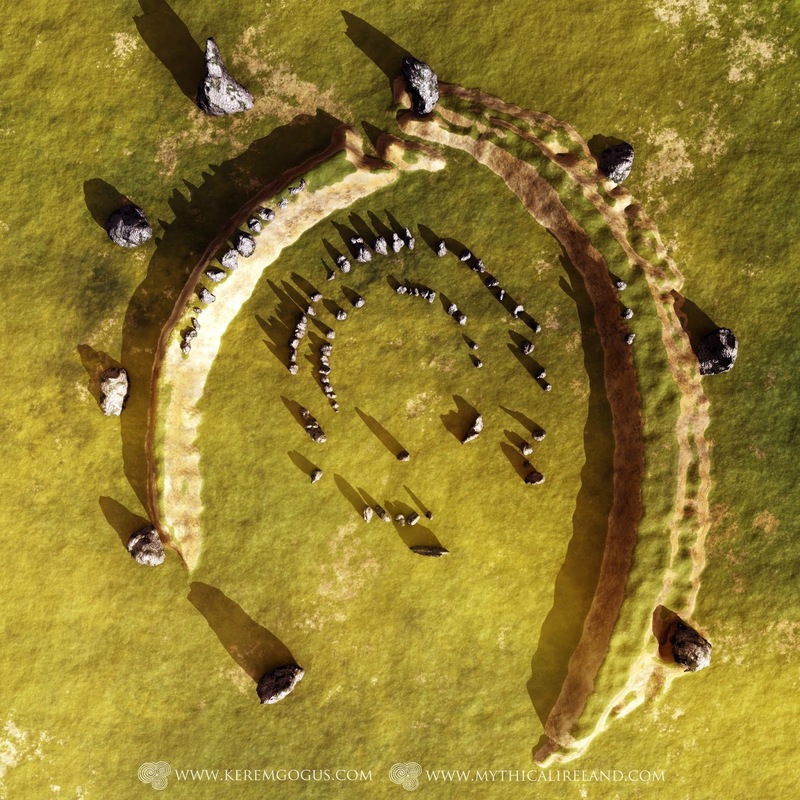 Since then, the monument was destroyed, such that it was thought to have been lost completely until its "footprint" was found on an aerial photo of the Carnbeg area outside Dundalk, Co. Louth, in 1988.
life by in this new image by Kerem Gogus. With only Wright's drawing to go on, Kerem made a couple of images about a decade ago showing what the stone monument might have looked like. 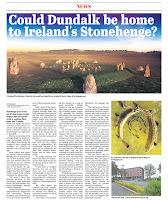 But this week, following my revelation that some of the largest stones of the monument might actually be buried beneath the soil where they once stood, the Dundalk Democrat newspaper wanted to do an article about this discovery. Their reporter Ian Cameron contacted Kerem and he agreed to make new images, which give us the first conceptual overview in high resolution of how this monument might have looked if we could transport ourselves back in time. The images give us a unique glimpse at a unique monument. As a result of Kerem's fantastic work, we are able to visualise this once dramatic man-made construction. The monument consisted of two concentric stone circles surrounded by an embankment with a ring of huge stones outside. 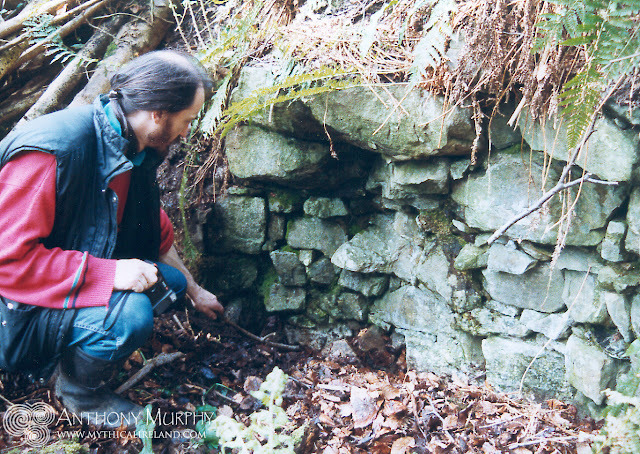 While doing research over the years, he [Anthony] read that some of the smaller stones were taken away and used as gate posts. He believes it should be possible to locate even some of these in the area. Old stone gate posts are easy to spot and quite rare these days. Other smaller stones were sadly broken up to be used as material for roads. The Armagh road (now known as the R177) effectively cut through the site. “The road was not there in the 1740s when Wright made his drawing. As far as I can ascertain, this road was built in the 1750s (maybe some of your readers might have more information about the exact date of construction?) and would undoubtedly have led to the part destruction of the monument. “For years, I've believed that all of the stones were either removed or broken up. But I've discovered a source (Bassett's Louth Directory from 1886) that says some of the larger monoliths (all but one) were buried: ’Most of the rest were dropped into holes sunk behind them, and covered at a sufficient depth to escape the plough’. For me, that's very exciting news. It means there's a possibility that the largest stones - at least some of them - are still there. It might be possible, using archaeology, to ascertain how many are still there, and there's even the tantalising possibility of discerning potential solar and lunar alignments of the site, which was described in the early 20th century by historian Henry Morris as having been an ancient 'school of astronomy'." 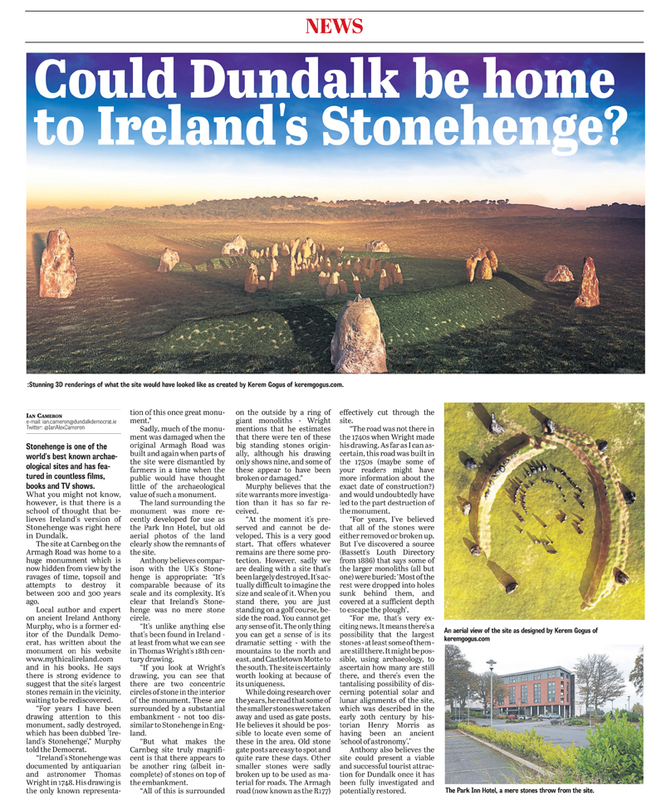 Anthony also believes the site could present a viable and successful tourist attraction for Dundalk once it has been fully investigated and potentially restored. 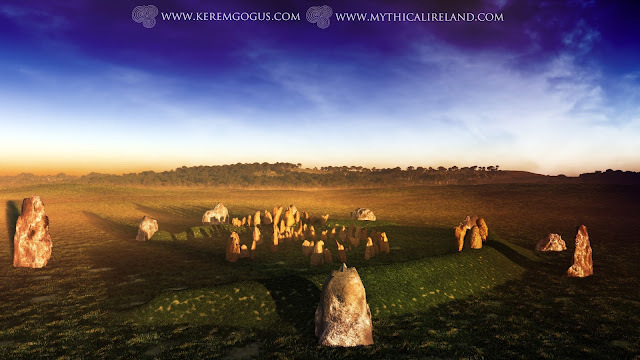 Another of Kerem Gogus's wonderful new 3D images showing what Ireland's Stonehenge probably looked like.